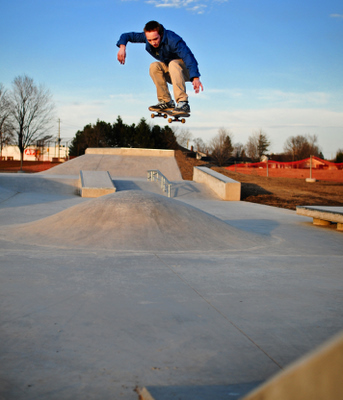 The Sault Ste Marie Skatepark is a 5000 ft² street style skateboard park. Which is half the size of a basketball court. I was contracted by Spectrum Skatepark Creations to do just the skatepark design. Once again I got to work on the fun part and they pulled together the rest. The goal was two separate areas. The upper section which has small obstacles and the lower section which is more advanced. When the park is not busy you can flow from the bottom up to the top and back. When more people arrive the park allows for separate sessions both in the top and bottom areas. The top area is located close to the parking lot for easy access and the bottom areas located close to the access road. I used the contours of the land to create a park that started high and sloped down the hill. From the top is a small quarter pipe, flat rail, and ledge. This creates a great section for having fun on the smaller obstacles. When the park becomes busier than the upper and lower sections function independently of each other. This means that in a small space more than one user can still enjoy the space at the same time. The top area also leads to a double set with the step-up gap, large rail and two large hubba ledges. Pretty advanced stuff. This leads into a hip with a box on the top. That changes direction to follow alongside the hill. The lower section has a bank to ledge obstacle with a few other manual pads and small rails. There is a roller and a flat bank to quarter pipe at the far end. By using the terrain of the site to accommodate some of the elevation changes. This allowed a large set of stairs and “hubba” ledges to be created without the extra cost of construction fill. It saved dollars and made the park blend into the surrounding area. In the design I included some new and innovative skateboard features. Altering some of the angles, curves and heights of many typical skateboard features I was able to create some new and unique ones that only the Sault Ste. Marie skate Park will have. This was a challenging project due to the site footprint. Yet another great project designed by me and built by Spectrum. 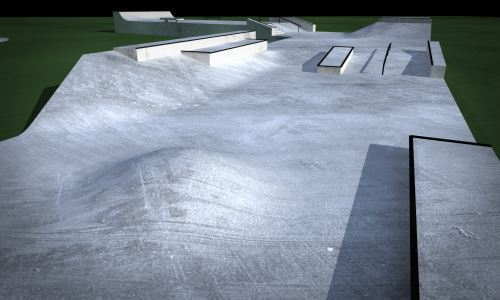 The Sault Ste Marie skatepark is a design I am most proud of.